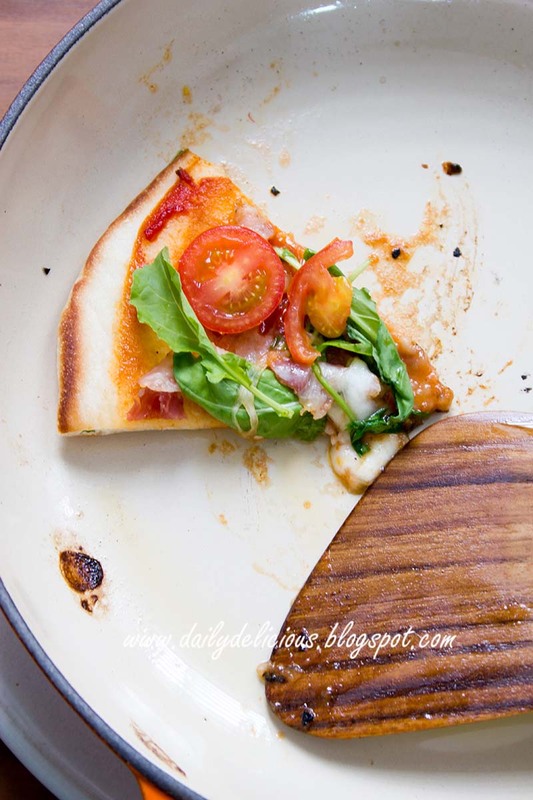 dailydelicious: Easy Stove top Pizza: no Oven needed! This recipe is one of many (many, many) recipes that I want to make a long time ago. 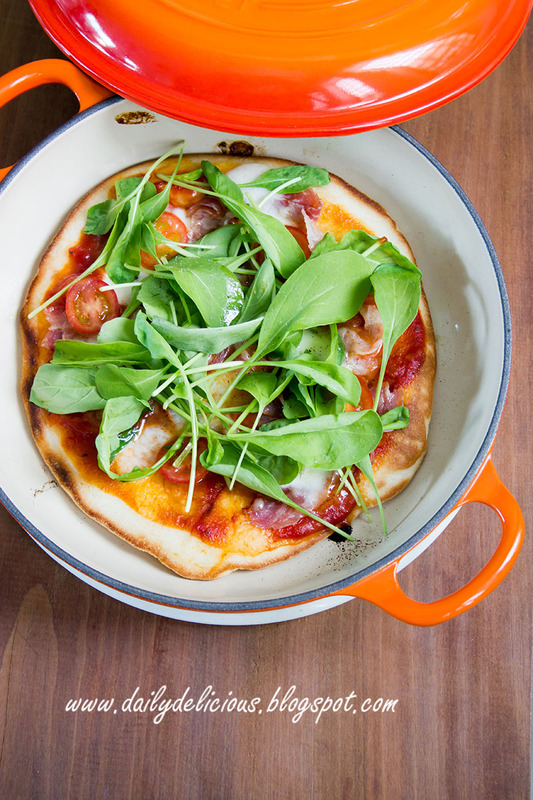 Stove top pizza! How can you make pizza if you don't have an oven? 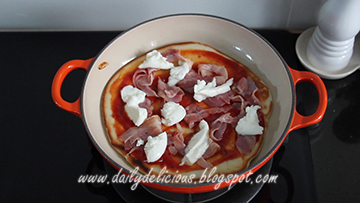 This method is the answer, you can have pizza in less than 10 minutes (I count only the cooking time ^^). 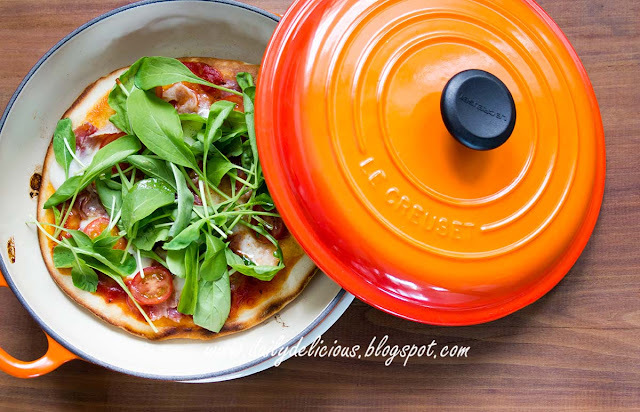 I love the fact that you don't have to preheat the oven when making it this way, as you know that pizza need very high temperature, and the cooking time is longer. 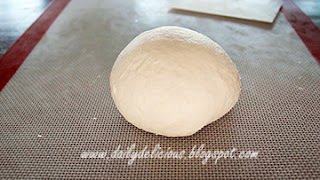 You can see that this recipe use all purpose flour, it's easy to knead and your pizza can be shaped easily too. 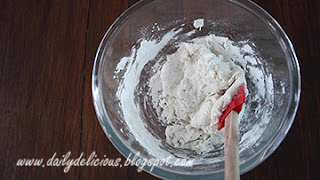 With this recipe, you will get 2 pizza, well you can half the recipe, but it's easier to knead this amount of flour. If you want to cook it later, just shape it into round, cover tightly with plastic wrap and aluminium foil and freeze until you need it, you can have pizza any time you want. For the topping, I didn't give you the recipe for sauce, as I think that it's quicker to use the can one (Ok, I'm lazy, haha). 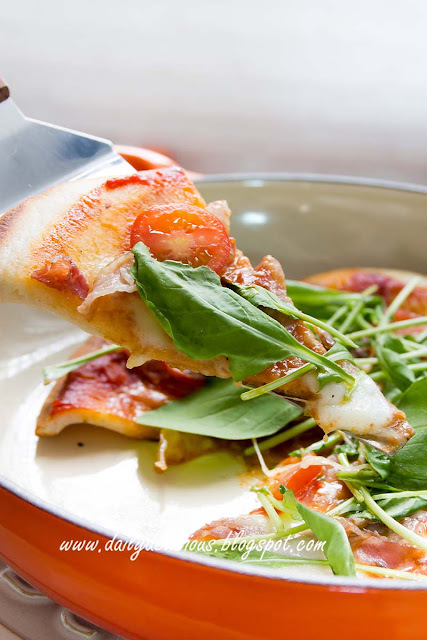 You can have anything that you want on your pizza, just remember not to put too much of the topping that's all. 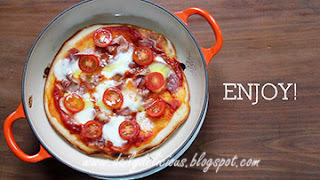 So, enjoy delicious pizza at home is not hard, and yes, you don't need to buy an oven too. Put flour, sugar and yeast into a bowl and whisk to combine. 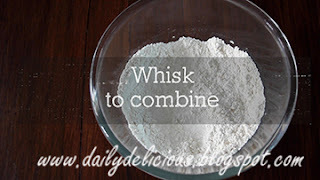 Put salt into the bowl and whisk to combine. 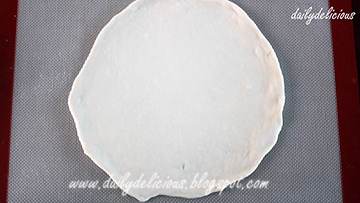 Pour the water into the bowl, mix with spatula. Remove the dough from the bowl and knead until smooth. 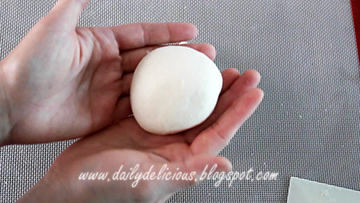 Divide into 2 equal pieces, roll into a ball and cover with olive oil. 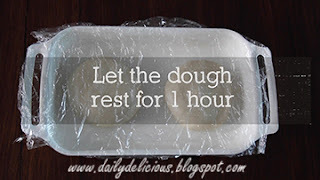 Cover the dough with plastic wrap and let the dough rest for 1 hour. 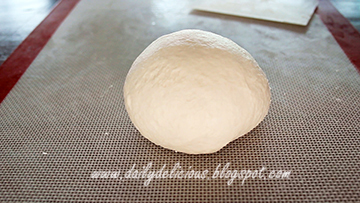 Roll the dough into 22 cm round. 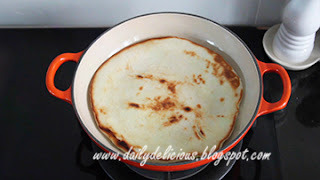 Place 22cm pan over medium heat. Brush the pan with olive oil. 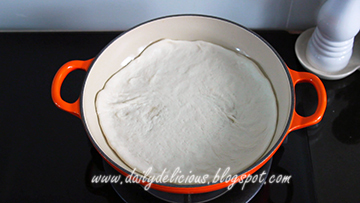 Place the dough in the pan. Flip the dough and lower the heat to low. Spread the sauce over the dough, put the topping over the sauce. 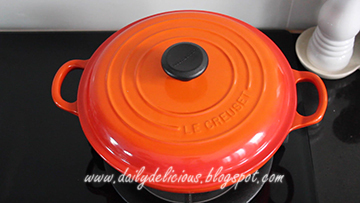 Cover with lid and cook for 4 minutes. Cool! 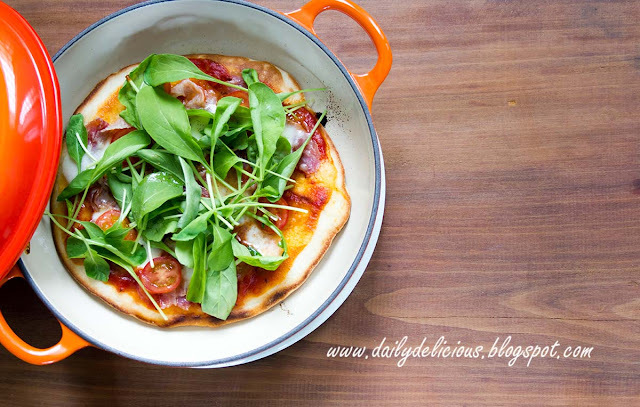 It is really great to be able to cook pizza without oven! I will show off to my friends these weekends:) Thank you so much for a great recipe!